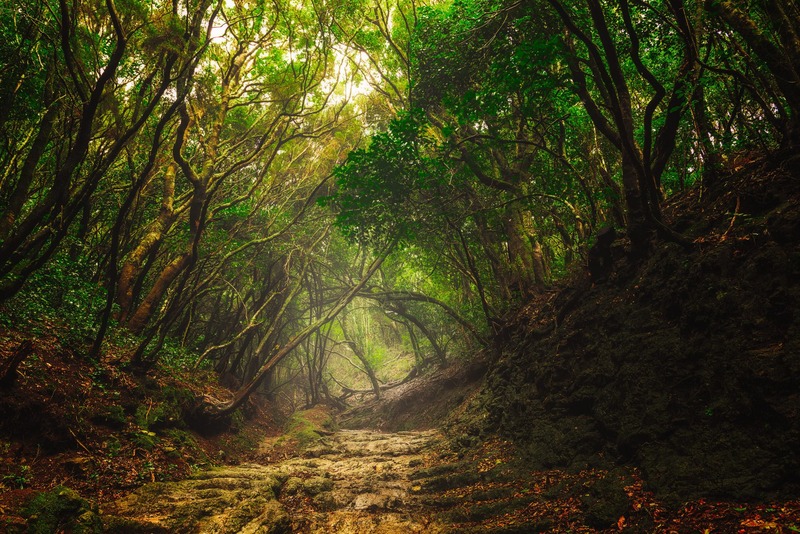 The Anaga Mountains made us feel like being in the middle of the forest from Grimm’s Little Red Riding Hood, because of shapes of trees in Laurel Forest. Another time, we found ourselves in a small, isolated village that stretched across evergreen mountain slopes and looked almost like from an ancient Mayan civilization. It happened just after we were surrounded by water drops that came up from the strong waves of the Atlantic Ocean hitting the giant rocks of the northern coast of the island. And all of this right after seeing a small part of this Mountain chain. Have you ever dreamt of being in a cloud forest? You know, like from the movies, when suddenly, a jungle is covered by mist and the hero watches every shadow between the trees? We always thought that you must travel to at least as far as South America to find this kind of a forest. 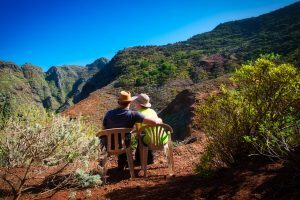 How surprised we were to discover that our few-hour walk in the Anaga Mountains north of Tenerife will be such a walk in the clouds, disappearing and reappearing, with just a small gust of wind. We planned the trip to Anaga Mountains for a while, researching the trails, the places we can visit. Winter is not the best time to walk up there without sound knowledge about paths that might be muddy and steep. Inspired by the pictures of Laurel Forest, which looks like the forest from Grimm’s Little Red Riding Hood, we found a walking path which would take us inside of such tale. The Anaga Area belongs to UNESCO as a World Network of Biosphere Reserve. The area was formed by a volcanic eruption 7-9 million years ago. 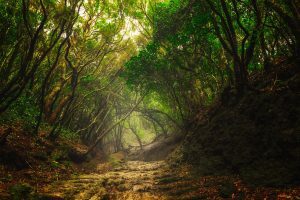 What is special about this place is the Laurel Forest which evolved millions of years ago on the supercontinent of Gondwanan, and there are only a few places like this left in the world. Today, this location is home to various endemic animals and plants. The car roads are exceptional there as is the story. The real fun starts when you take the walking trails and climb those mountains. The Anaga Mountains reach 600m over the sea level in the highest places, so we thought that it’s not a huge challenge to walk for few hours, even when the weather conditions are not optimal. We found some walking tours on an app and we were well-equipped with trekking shoes and rain jackets. We started in a place called Vega de la Mercedes, which, in the beginning, seemed to be like any European forest. However, the deeper the path led us into the mountains, the more fantastically shaped trees appeared in front of our eyes. The curved trunks and drooping branches made an impression of being millennia-old. At some point, we noticed we were surrounded by fog, right after hearing wind in the crowns of trees and being in sunlight. This wasn’t fog – we were walking in clouds! Nico was so fascinated by this natural revelation, that we spent almost an hour just shooting the photos of trails appearing and disappearing in clouds. We were discovering new types of forests every hour, new views over the mountains and new plants. However, we had an adrenaline boost not only because of the nature, but also because of some accidents on the road. Walking down or climbing steep paths is sometimes tricky, if the ground is constantly wet. At one point, we had the “brilliant” idea to shorten our way down to town where we left the car and took a shortcut, which our app suggested. We didn’t remember walking a steeper slope in our life than this one – we had to go down using legs and hands. In the end, we both finished sliding down with our heavy camera backpack on. Fortunately, we managed to stop before the precipice and nothing from Nico’s equipment was damaged. The look down convinced us to climb back up and take a rather long, but much safer path. We had to laugh at ourselves when we reached the town at the bottom. We looked like after a mud-bath. But what was worse, we were starving after hours of walking. So, in the end, we had to go to a restaurant in this place and we did not look too, hmm… representative. Despite the tricky paths, we were so uplifted by the beauty and natural diversity of this place, we decided to come back there again and again – at least when we retire. On another day, we felt tempted to discover the northern part of Anaga Mountains. 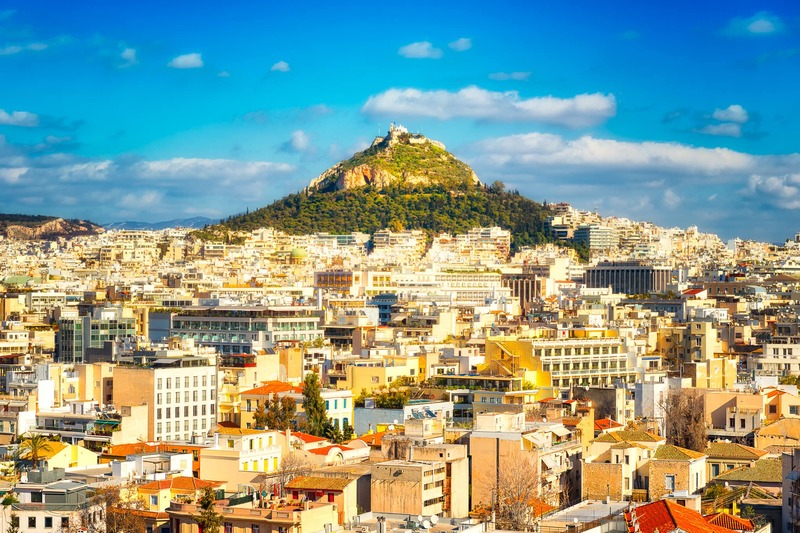 There was a particular place that Daria wanted to visit, which is called “Taganana”. It looks a bit like a Mayan civilization town nestled in evergreen mountains. The brightly colored walls of the squared houses strongly contrasted with the deep green and grey mountains. It wasn’t only an impression of an isolated place – it was difficult to reach. To see this village, we had to pass an almost all-mountain road so curved, that sometimes it turned left or right 180 degrees, a couple of times in just a few kilometers. But it was worth it. The calmness and majesty of this place soothed our nerves after this crazy drive up and down. Almost behind this village were the Benijo beach and La Roca. The place which Nico dreamt about in his photography vision. 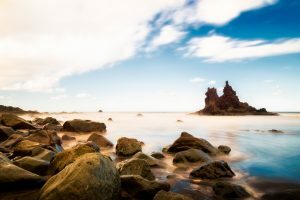 It is the northern shore of Tenerife. The slopes of the mountains suddenly finish there and dominate over the black-sand (volcano remains) beach. However, what was fascinating to us the most were giant rocks which surfaced from the ocean in front of our eyes, once we went down the stairs from the hill to the shore. The enormous waves were crashing against them, leaving pearls of water in the air. We had to shout to hear each other because of its noise, and we couldn’t imagine how someone could swim here… However, for Nico, it was a photography paradise and a new challenge, as he didn’t do that many shots from such a rocky coast before, where the water just splashed in front of the lens. 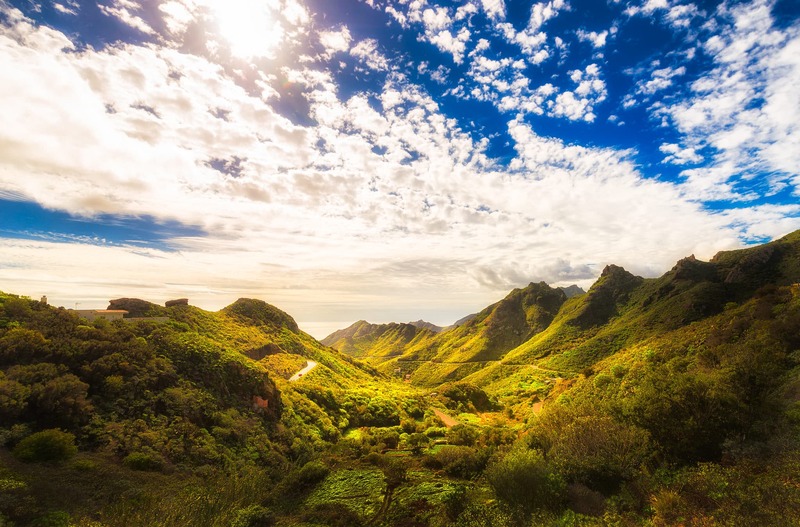 The Anaga mountains was one of the reasons we fell in love with Tenerrife. Such savage, ancient nature connected with views over scenic villages, reminiscent of ancient South American cultures took our breath away every few kilometers we did by car or by foot. The roads in Anaga mountains caused us a bit of vertigo sometimes, but they were also an adventure. However, what struck us the most was this feeling of calmness, being close to nature and its origins.